You can find it over at Martins "not a blog" and on HBO there is also a new (i think) behind the scenes feature to see. From the new short trailer i can say i find Catelyne very disappointing even if it is a very short scene, probably after Bran fell from the tower (i hope) cause she seems to be just falling apart in tears. Also the actor they chose for Jon seems like he is going to burst in tears any second. Not at all what i imagined Jon would look like in any way. Robert and even Cersei look weak. And Tyrion gets better an better though i detect a serious lack of beards on him and Mormont. Tyrion doesn't grow a beard until ACoK. And I can't help but note that that's how Catelyn is described at this point in time. After Bran's "accident", she is "mad with grief". She looks like she ages twenty years, sitting by his bed night and day. This is a new scene showing her pleading with Ned to remain, now, and I actually thought she was playing the part perfectly: though mad with grief, you can see her struggling with trying to hold back back the tears that she can't hold back, to present that together, rational demeanor that she is supposed to have as Lady Stark, as a Tully. Of course, days later when Jon comes by to visit, she's already been suffering through this grief for quite awhile, and it's taken her toll: at that point, she's disassociated, voice flat and unemotional. Yet that scene ends with her weeping. And Jon did feel very sorry for himself through a lot of aGoT. Especially at the beginning before he got a talking to from Donal Noye. Nice. However, GRRM made a mistake, the behind the scenes look will not be this sunday (today) but next sunday, December 5th. Someone should point this out on his blog. And Catelyn looks HORRID. The previous actress was much, much better. Catelyn is supposed to be attractive. Catelyn in her grief is said to look as if she aged twenty years. That's mid-50s in the novels. Jeebus. There's a third teaser tonight which we've reported on. That will be airing tonight, either before Leap Year (around 7 PM EST) or before Boardwalk Empire (around 9 PM EST). The full "Inside Game of Thrones" is indeed on the 5th. Tomorrow will bring a new trailer? According to Ran, there will be a new trailer this Sunday night (tonight) on HBO. Forgive Ran. I had not read. Does anyone know if the trailer will last longer than 30 seconds? I hope it lasts longer than 1 minute. I'm so excited for Fairley. I saw her "back" in the last Harry Potter movie (when Hermione was looking at her folks sitting on the couch) and I let out a quiet squeal. She IS gorgeous, but she is also not 22 years old here. I am starting to think that people want some CW tart who is 19 years old to play Catelyn. When a woman is grieving over her husband leaving (for lord knows how long, AND going into a very dangerous situation) and her son being flung out of a window . . . well . . . you're not going to give two hoots about what your face looks like here or how much you are crying. People are not taking into consideration that though she might not be THEIR choice physically, that's all they've really seen of her are stills and very short shots. Actors/actresses can become infinitely more attractive once you get to know them in character. But, I'll reiterate, I find her lovely. There's no way around it. It's really frustrating to come here and have people comment on how "ugly" they find a certain actress. I'm tempted to ignore a good handful of folks so I don't come here and have to listen to them constantly whine about really stupid, petty stuff. Well ok, i can understand Catelyn is distressed a lot at that point in time. Hopefully she will present her other side more later on. It may have been just the choice of words, that "17 years ago you rode off with robert,... and now youre leaving me again, sob". It just seemed like a wife sobbing because her husband goes out with his friends and doesnt stay home. bBawww you dont loooove meeeee!! I dont know, it just didnt sit well with me taken out of context like that. And i dont really agree with the choice of the actress and how aged everyone is. Jon is unforgivably irritating though. Tyrion will look awesome with a beard. Shame they didnt go with canon hair and eye colors. Robert is not convincing. Looks more like some good natured fatso then someone who smashed Rhaegar and won every melee in tournaments etc. There should be traces of that person visible still. He is too small. Cersei looks too old and well past her prime, even fake and definitely not blonde enough. Theyre supposed to be golden not light brown. Now that... is the proper ... jeau de vivre. Sean Bean's thoughtful affectation is amusing, like he is saying something profound. A choice was made to make the characters older. Particularly the children. It makes the series a lot more realistic given what the children get up to. But if the children are older then the adults have to be older too. Catelyn has given birth to 5 kids. One is 17. She is close to 40 in this TV series. And its strange. People criticise Tyrion for not been ugly enough and say HBO are taking a typical Hollywood approach. Well at least they'll hopefully remember that Catelyn is apparently too old also. Balance things up a bit if they care so much. Although, shouldn't it be good that this show isn't trying to cast glamourous models in every female role? You could argue that Jon is irritating in the books also, so hardly an issue. I really don't care about eye colour. Cersei's hair just has to look similar to Jaime's. The exact shade is unimportant. For somebody who talks about the importance of book canon this is also very strange. Read how Robert is described in the opening chapters of aGoT. He is unrecognisable as the man who smashed Rhaegar! That's the point!!! I agree, but they should have blackened his hair and beard. His beard is so gray that it looks as if he is much older, and his hair is light brown. He has a suitable resemblance to Brian Blessed, that's all that really matters. As well as getting fat, maybe they want to suggest how ruling has aged him? Not sure. look at pictures of presidents from when they took office to the end of their term. most of them look like they've aged considerably. so it makes sense for robert to look older since he became king years ago. i think they all look fine. i know everyone likes to nitpick but lets not get ridiculous when some character has a few strands of hair an off shade of what we imagined. I still don't get the complaints about Mark Addy as Robert. 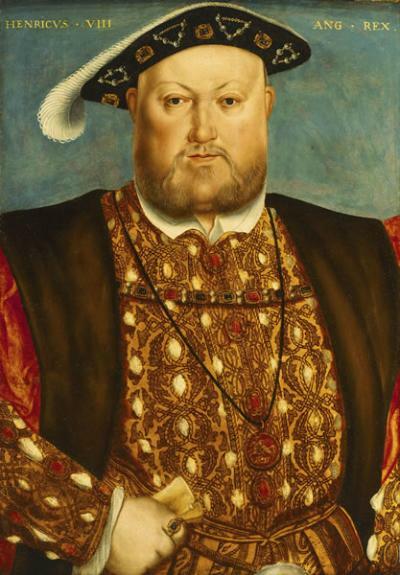 The guy looks shockingly like the official portraits of Henry VIII, who is one of the templates for the character of the book. What more do you want? Again, with Michelle Fairly as Catelyn, I also don't get all the crying about it, and from just a few shots and one line of dialogue? It's impossible to make a decision about her performance from that. Never mind that it's clear some people don't remember what the context of the scene is and the character's state of mind at that moment in the story. I agree, when I first saw the casting I wasn't thrilled, as I had only seen Addy in Still Standing, but I've been continually impressed with how good he looks as Robert. Honestly, he looks damn near perfect in my opinion, so what if he maybe isn't as tall as the books describe him? He's pulling the look off, and that is way more important than settling for someone else over a few inches height difference. GRRM got a little carried away with the heights of his characters. But then it was a fantasy series. He was free to exaggerate after spending years confining his imagination to TV scripts.